DESPITE the recent spate of crimes and acts of violence in isolated parts of Negros Occidental since the start of the election period, the province remains peaceful enough to avoid being placed under the control of election officials. Election Commissioner Rowena Guanzon told Sun.Star Bacolod on Thursday, March 31, that high-risk areas in the province have already been identified by the Commission on Elections (Comelec), the Philippine National Police, and the Philippine Army, but the magnitude of incidents in these areas do qualify them to be classified as an election watchlist area (EWA). “They have identified risk areas like Isabela, but to say that the entire province is very high-risk to be controlled under Comelec, not to that extent,” said Guanzon. The commissioner arrived in Bacolod on Thursday to take part in the signing of a peace pact among local election candidates on Friday, April 1. The Negrense poll official said she was hoping there would be no more election-related violence in the province. During the Regional Joint Security Coordinating Center meeting on Monday, the Comelec, police, and army maintained that there were no EWAs in the province. However, Chief Superintendent Conrado Capa, director of the Police Regional Office in Negros Island Region (PRO-18), identified four localities that were being monitored as potential hotspots. These are Escalante City, Isabela, Moises Padilla, and Toboso. 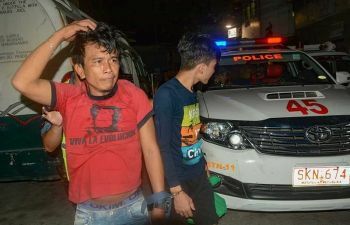 Governor Alfredo Marañon Jr. had also directed the police and the army to augment security in seven local government units, including Moises Padilla, La Castellana, Isabela, Salvador Benedicto, Toboso, Calatrava, and Escalante City. The governor said election-related problems like threats and intimidation, illegal drugs, and illegal gambling were present in these localities. Last February, rebels ransacked the house of a village chief in Isabela. Sightings of armed men were also reported in the town. A week after, rebels ambushed six personnel of the Candoni Municipal Police Station, killing two policemen and injuring two others, as well as a civilian. Guanzon will lead the peace covenant signing in Negros Island Region today at the Bacolod Pavillon Hotel. She will be joined by Rafael Olano, Comelec director for Western Visayas, as well as Provincial Election Officers Ian Lee Ananoria of Negros Occidental and Lionel Castellano of Negros Oriental. Marañon, his running mate Fourth District Representative Jeffrey Ferrer, and Vice Governor Eugenio Jose Lacson have pledged to sign the pact. Negros Oriental Governor Roel Degamo and running mate Doc Estacion would also join the signing rites. Vice Governor Edward Mark Macias said he would not be able to attend the signing due to a prior commitment, but vowed to abide by the peace covenant he and other candidates signed earlier in Dumaguete. Guanzon said the peace covenant would not only show unity among candidates as one Negros, but would also ensure peaceful and credible elections on May 9. Ananoria urged the candidates to take the peace covenant seriously.